To make a bike from scratch, the task is quite time consuming. For this you need to have the skills of turning and plumbing, and have access to a shop equipped with the necessary machines and tools. But to collect the bike from the finished parts it is possible to anyone. First of all, you need to develop a drawing of the manufactured bike. It is better to use ready-made drawings that Amateurs and craftsmen hang out on the Internet. If you have design skills, you can create a drawing yourself. It is very responsible on the bikee, manufactured by calculated wrong drawing, skating would be impossible. In addition, if you incorrectly calculated the load on some joints will have excessive load. This will lead to the accumulation of metal fatigue fracture or fractures at the joints of parts. Or, to put it simply, the bike will fall apart at the most inopportune time for you. Keep in mind that you can make at home wheel and chain mechanism with the driving and driven gears is not possible, so all these details you will in any case have to buy. After you took possession of your drawing, carefully it carefully. For the frame you will need a metal tube of different diameter. Get the right material and start to implement each element separately. Check the workpieces for defects and cracks. Manufactured elements are connected in a single whole with the help of spot welding. For the manufacture of plugs you will need a press to install the small size and gas welding. You can use the forge and tools designed for forging metal. When the frame and fork are almost ready, you will need to drill holes for the leading "stars" in frame and mounts wheels in the frame and fork. The holes must be strictly perpendicular to the longitudinal axis of the frame and located parallel to each other. Then you need to make the steering wheel go, leather saddle with seatpost, pedals. Fasten all parts to the frame, hang the chain mechanism, wheels, a braking device. You can now start testing. If the technique adequately kept on the road, it does not lead to the side, the pedals rotate fine without any additional effort, the Bicycle again to disassemble and prepare for painting. If riding discomfort or detected any problems during the tests, you need to find and eliminate possible causes. 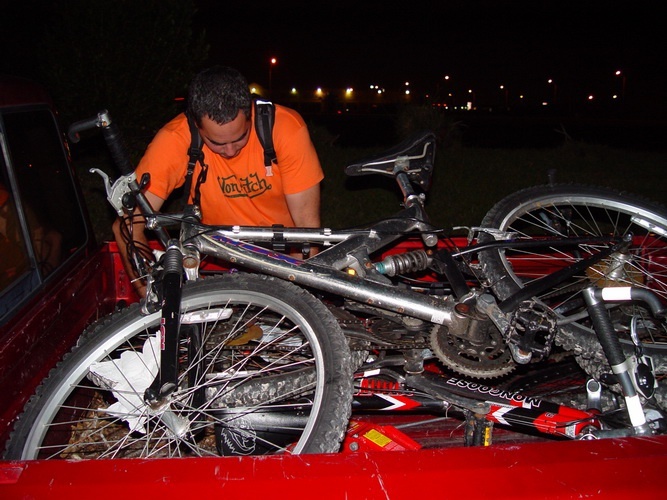 Repeat this procedure until until the bike will not be well established and properly operating as a single mechanism. But why hold yourself to such difficulty, when it is easier to buy ready-made parts and assemble this bikewhat you want? You can build the best easy option. Buy titanium, or if budget does not allow, aluminum frame. And hang it components, according to their own perceptions of price and quality. Rims for wheels, spokes, tires, tires, Cams, steering stem, steering column, steering wheel, hard or soft plug, brake pads, brake cables, brake handles and the like less important details – all this can be bought separately and are not dependent on each other. Than comfortable like this "designer": at any time do not suit you or the defective parts can be replaced with a new one, bought at the local bikeMr. the store or ordered over the Internet.